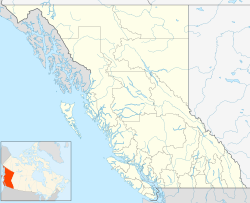 Naramata is a community within the Regional District of Okanagan–Similkameen in British Columbia, Canada. Naramata is situated in the Okanagan Valley on the southeast shore of Lake Okanagan, to the north of Penticton. In 2010, Naramata was the second Community in Canada to be designated Cittaslow. On the edge of the northernmost reaches of the Sonoran desert, Naramata is situated in Canada's only semi-desert region. The topography is reminiscent of a blend of Southern California and Southern Italy. Founded in 1907 by John Moore Robinson as a prime agricultural area. He advertised and sold parcels of land to people from other parts of Canada as well as the British Isles. At the time Naramata became known as a cultural centre. People from across the Okanagan would arrive by boat for concerts, plays, operas, regattas- and as Robinson and his wife were spiritualists-seances. In fact, it is said the name of the village came about during one. Paddlewheelers regularly stopped at the local wharf carrying freight and passengers up and down Lake Okanagan. In 1914, Naramata received a new link with the rest of Canada when the Kettle Valley Railway was completed on the hillside above the village. Due to the intense volume of rock work it gained the reputation as one of the most difficult stretches of KVR construction. It was in operation until 1974. Today, remnants of the KVR make for great exploration, such as the train tunnels, rock ovens, and the railway right-of-way which clings to the hillside high above The lake and is now part of the Trans-Canada Trail. By the 1950s Naramata began to see people arriving to farm from other countries, such as Portugal, Italy and the Netherlands. There are still many fruit orchards in Naramata. The varieties include peach, plum, pear, cherry, apricot and apple. Naramata is more known now, however, as a top wine-producing region in the country and its wineries have begun to attract international acclaim. The decline in the relative economic importance of fruit growing has occurred but the impressive landscape still abounds with orchards. The most savvy growers no longer sell to the Naramata fruit-packing facility (part of the Okanagan Tree Fruit Co-operative), but rather sell privately, often preferring to deal with international brokers. Naramata is also the setting for the film My American Cousin, written and directed by Naramata local Sandra Wilson. Agriculture and tourism form the economic base of the village of Naramata. The agricultural sector once mostly consisting of orchards is rapidly being supplanted by vineyards and wineries that are collectively referred to as the "Naramata Bench". Tourism is served by motels, beach side resorts and a variety of bed and breakfast operations that cater to summertime visitors. Summer months see a spike in inhabitants and economic activity. 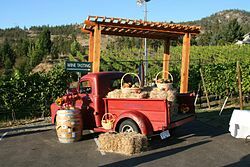 A farmers market is held weekly and there are numerous roadside produce sellers in addition to the wineries, cideries and craft spirit producers. Since the 1960s and continuing to this day it has been a rite of passage for countless French-Canadian students to make their way across the country and pick fruit for a summer. Much of Naramata lies within the bounds of the Agricultural Land Reserve, created by the British Columbia government in the early 1970s as a food security measure and largely responsible for preserving the character and pace of Naramata which is seen by many as its biggest charm- after the breathtaking scenery. The Centre at Naramata, a conference and educational centre of The United Church of Canada, was founded in 1947.